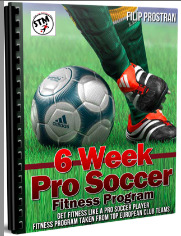 Looking for a soccer agent now that you've finished your club or college football and are ready to take the next step? Or maybe you just want to switch agents; well in either situation this is what you need to do. First, you'll need to establish some sort of contact with an agent, the earlier the better. The way to do this if not connected with one already is to go to the Registered FIFA AGENTS list and start looking at the agents list. Select agents in the countries where you would like to go for trials. The reason for this is agents have the most contacts in the country they live and do business out of. Instead of sorting through thousands of possible agents, I've created a list of Europe and Asia's best who have a proven track record of getting players trials. 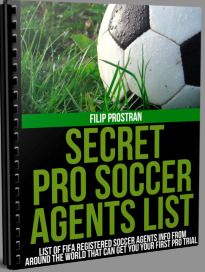 Find that list in my ebook Pro Secret Agents List. Have more questions not answered yet? Feel free to Contact a Pro and ask me anything! Well in the email make sure to be honest. Tell them who you are, how old you are, where you have played, what you are looking for and what sort of professional soccer tryouts you want. A CV (soccer resume) and highlight tape are essential, don't think an agent is going to want to represent you because your last name rhymes with Ronaldo, you need to approach the first level of contact as professional as possible. Don't be shy or reluctant to tell them exactly what your aspirations are. If it's to play in the Premiership or if it's just a shot in a lesser-known league that's fine but make sure you put all your cards on the table. Should I email every Agent on the list? Feel free to contact any agent in any region you would like to play. For example if you want to play in Spain then contact some spanish agents because most agents have the most contacts within their own country or surrounding area which is to be expected. But ya why not shop around? Not many will get back to you so promptly so send a lot of emails, but don't send a mass email, you'll look more desperate then the last kid picked at recess. Should I be expected to Pay the Agent Anything? Listen closely, any agent you contact that wants something for nothing, forget him all together. The way it works is you contact the agent, he finds you a trial, the team wants to keep you, you sign with your agent (for about 7-10% of your salary) then you sign with the club. You'll probably be the one paying your airfare and such things to get to your first trial or two so the agent has no costs at all, and don't be tricked by any hidden costs they may say, let them find you a trial then start speaking more seriously about payments. If the soccer agent you contact wants money up front before he's done anything, delete that email and never speak with him again. Period. A good soccer agent is an honest one (oxymoron right?). One that tells you exactly what they think they can do for you and doesn't stop until he/she does. But you need to be patient, don't think the day they get back to you and tell you they'll find you something that that following week or month they'll have a trial ready for you. These things take time and expect it to be a long process. What if No Agent Gets Back to Me? Don't hold your breath after sending the first set of emails. Believe good things will come, always stay fit, positive and mentally strong, your professional soccer tryout will come and you'll have a soccer agent that cares in your corner. Your shot will come. Yes and No. If you’ve signed an exclusive contract with your agent then no you cannot have another agent look for trials for you. If you have a non-exclusive (I always had these) contract then you are free to contact other agents while signed with your current one and have more than one agent working to find you a trial at a time. If you’ve yet to sign a contract with any agent (generally happens your first time looking for an agent) then you can have as many agents as you like. They can all be searching for trials for you, when one does you start to talk to them more seriously about signing on with them. How Many Agents Do Pro’s Go Through During a Career? It really depends on several factors such as how long they play, which level they started at and which level they currently play at, how old they are etc. 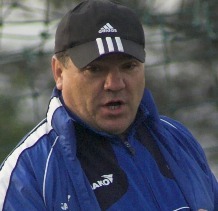 Generally as a player moves up in the ranks they will look for a soccer agent that has contacts with higher level clubs. A player can really have as many agents as they want through their career as long as they aren’t breaking any exclusive contracts with current agents.